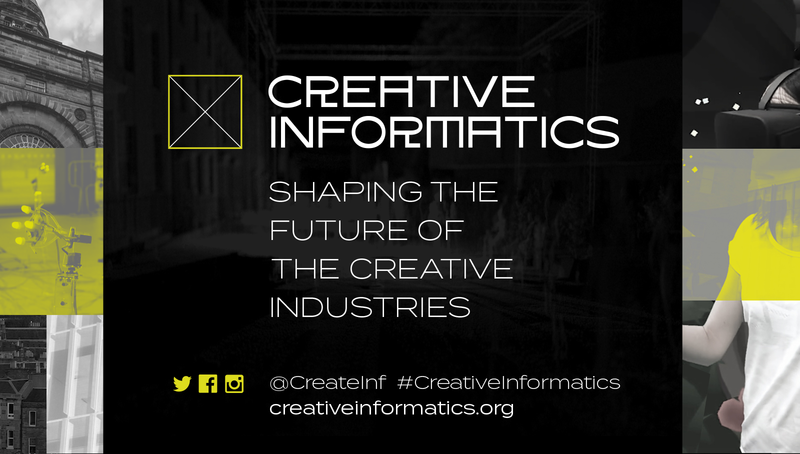 Creative Informatics is a £10 million R&D partnership for the Creative Industries. The funding will create the environment for new forms of creative industry that uses data from a range of organisations to encourage innovation across the sector. The award is part of an £80 million nationwide creative industries initiative from the Arts and Humanities Research Council (AHRC) – the largest-ever single investment in the sector. The Scottish Funding Council will provide further financial support. The core partners of the programme are the University of Edinburgh, Edinburgh Napier University, Creative Edinburgh, and CodeBase, the largest technology incubator in the UK. To make Edinburgh a world class centre for creative industries talent who can design and research with data. To achieve a step change in the use of Data Driven Innovation to develop new products, services and experiences through R&D. To foster an ecosystem for Data Driven Innovation that creates new startups and scaleups and transforms existing creative industries. Creative Informatics will eventually take up its long-term home in EFI, where it will find long term sustainability through further research grants as well as ongoing support from the City Region Deal, Scottish Enterprise and the City of Edinburgh Council. Challenge Projects: R&D projects co-created with academic, industry and cultural partners. Horizon Projects: The partnership will curate and convene small teams (software, creative, business partner) to pursue projects within a nascent data driven technology. Creative Informatics Labs: Monthly workshops for partners that provide direct access to sectors of the Creative Industries to demo, trial and explore new technologies. Creative Bridge: A dedicated DDI innovation programme for the Creative Industries predicated on a pre-accelerator model to help products and services bridge the Valley of Death to Series A Investment. Resident Entrepreneurs Programme: provide creative entrepreneurs with space, time and resources to develop products ready for the marketplace, co-located at partner organisations. Connected Innovators: programme for individuals who are able to span several disciplines needed to succeed, providing them with time and space to engage in R&D and build leadership skills. The R&D Partnership will foster data driven innovation across cultural and creative organisations and businesses, increasing their productivity and growth and use the expertise of data-focused businesses (software, IT, web etc) to provide new products and services for the creative industries. Furthermore, it will encourage creative entrepreneurs to found new businesses to capitalise on opportunities arising from the deeper understanding of data gained through their involvement in the R&D Partnership. A key strand of the partnership will be a scheme to improve data literacy in Edinburgh. It will bring together more than 25 organisations – including the Edinburgh International Festival, the Fruitmarket Gallery and the BBC. Over the next five years, it will also seek to create more than 60 new businesses. These will use data-driven technology to develop new products, services and visitor experiences. Project leaders suggest that the collaboration could lead to new commercial products for home entertainment, new ways to buy products and services by experiencing them first, and innovative online experiences for remote participation. It will also help to explore new synergies in the digital archives of the national collections. Talent: the development of DDI courses within the University will complement the AHRC funding which is focussed on developing talent within partner organisations. Research: the City Deal will provide infrastructure for externally funded R&D across Creative Informatics. Adoption: Creative Informatics and City Deal will also support adoption of DDI by organisations across a wide variety of sectors. Datasets: Creative Informatics and the DDI programme will invest in improving access to regional data assets which Creative Informatics will draw on. Entrepreneurship: the DDI Programme within Creative Informatics will support cohorts of Resident Entrepreneurs and will leverage funding for 72 stipends to Creative Informatics.